Copy rules from an existing behavior? Behaviors define the CRM activities you'd like to track or motivate. For example, you can define a behavior to motivate your team to "create more lead records with telephone numbers", and award one point per record to the record owner. Behaviors define what the KPI or Contest is about. If you create a contest from a KPI or target Action Menu icon [...], behaviors will be auto-populated for you. You can also choose from Previously Created Behaviors or New Behavior templates. Fine tune these behaviors by adding rules. Select a behavior template corresponding to the CRM module you'd like to focus on. 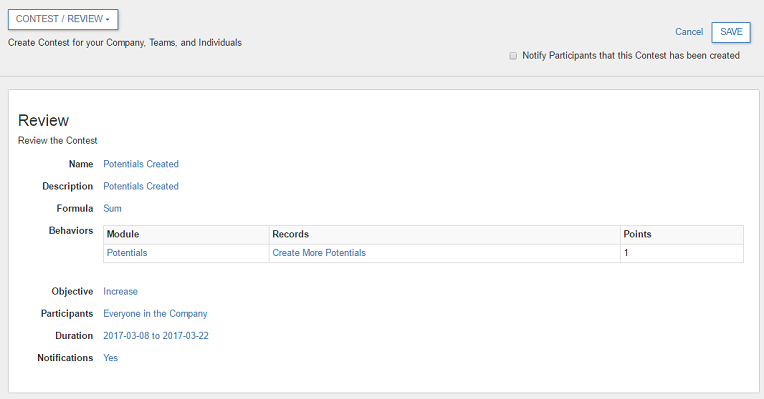 For example, to motivate CRM activities related to leads, select the Create More Leads option. You can define the behaviors in the sections below or copy rules from an existing behavior that was created previously. Define how points are computed. Select Set Points per Record option or any numerical field in the record as the basis for computing points. For example, for potentials, you can select Use the record’s Amount as points to track revenue associated with potentials rather than counting the potentials themselves. Define which records to select. Choose Created in the period to select records created during the contest period, or Modified in the period to select records modified during the contest period. Alternatively, you may use any date field in the record as the basis for record selection. Choose With Closing Date in period to select all potentials with a closing date in the contest period, or Include Dates in the future if you want to include records with dates that have not yet occurred. This is useful if you want to count all deals expected to close, or meetings expected to occur in the contest period. Define whether the record owner, record creator, or the last user to modify will be the point recipient. You may optionally define custom rules to filter records. Select whether to require Any one of the Custom Rules below to be matched or All of the Custom Rules below to be matched. Custom rules are filters applied to CRM records before points are computed and awarded. You can select any field in the record (e.g., Amount), followed by an operator (e.g., Greater Than or Equal to), followed by a value (e.g., $1,000). This would only award points for records with an amount field greater than or equal to $1,000.